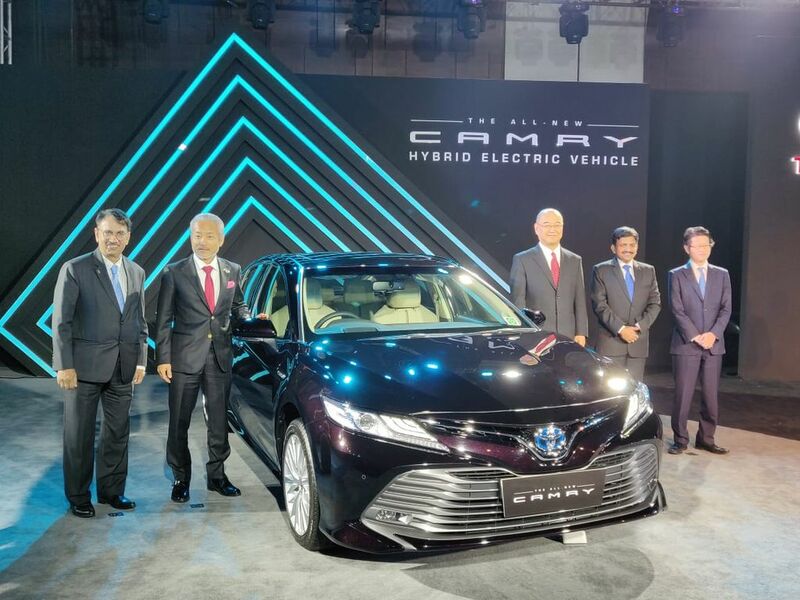 Toyota Kirloskar Motor has just launched the all-new Camry in the Indian market at an introductory price of Rs. 36.95 lakh (ex-showroom, pan India). Straight away, it is important to compare its price with the only direct competition, the Honda Accord, as both boast hybrid powertrains. Brought into the country via CKD route, the 2019 Camry is more than Rs. 6.2 lakh less expensive than its Japanese counterpart. The new generation Camry is based on the TNGA-K platform with bigger proportions and a more appealing exterior than the outgoing model. It is longer, wider and has increased wheelbase with bootspace expanded by 10 litres at 597 litres. The lighter architecture and lowered centre of gravity should help improve the handling characteristics of the new Camry. The front and rear passengers sit 22 mm and 30 mm lower to the ground respectively and the turning radius stands at 5.7 metres. There is a new rack-mounted Electronic Power Steering with “organ-type” accelerator pedal for greater control while the suspension is brand new with MacPherson struts at the front and double wishbone unit at the rear. 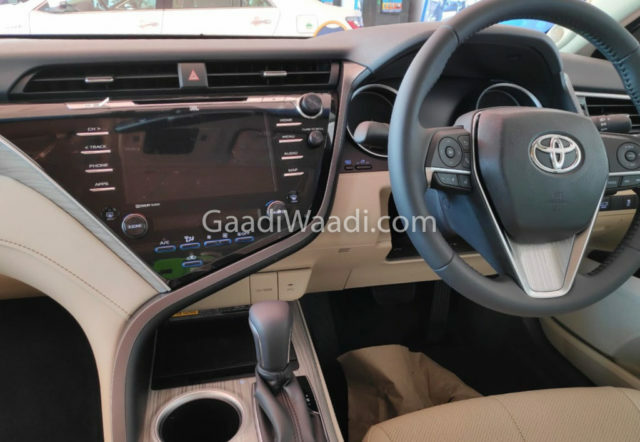 The improved driving dynamics is accompanied by an updated hybrid system with higher thermal efficiency of 41 per cent and the new NiMhH battery (replacing Li-ion) mounted underneath the seat is more compact and durable than before. The 2.5-litre dual VVT-i four-cylinder petrol engine is tuned to produce 178 PS at 5,700 rpm and 221 Nm at 3,600-5,200 rpm. It is connected to an 88 kW electric motor that helps in combined power output of 211 PS. Power is sent to the wheels through a six-speed CVT automatic transmission with sequential paddle shifters. The mechanical improvements made have resulted in 20 per cent more fuel economy 23.27 kmpl (previously 19.27 kmpl) and Toyota claims cleaner emissions than before in lower rpms or cold temperature. Majority of the exterior changes are applied onto the front fascia as the redesigned wider grille has become more prominent. It is amplified by the aggressive horizontal louvres and sleeker follow-me-home headlamps with LED DRLs. The rear end boasts new LED combination tail lamps while sharper ORVMs, new LED fog lamps and 18-inch aluminium wheels enhance the overall appeal. With high strength steel central tunnel construction for occupant safety, Toyota has presented a lot of active and passive safety features in the new-gen Camry such as ABS with EBD, Brake Assist, Park Assist with back guide monitoring, clearance and back sonar, Vehicle Stability Control, Traction Control System, Hill Start Assist, nine airbags. 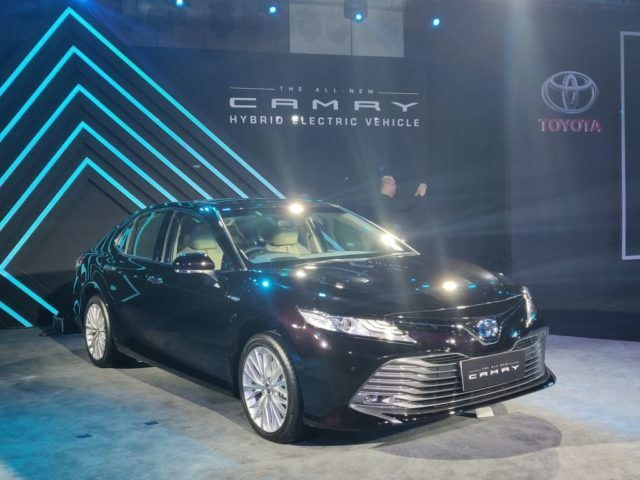 Toyota has presented a lot of active and passive safety features in the new-gen Camry such as ABS with EBD, Brake Assist, Park Assist with back guide monitoring, clearance and back sonar, Vehicle Stability Control, Traction Control System, Hill Start Assist, nine airbags. 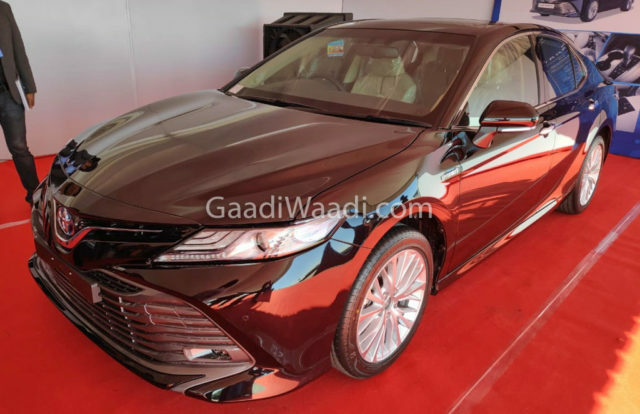 The eight-gen Camry is retailed in seven colour schemes in India: Attitude Black, Graphite, Burning Black, Silver, Phantom Brown, Pearl White Premium and Red Mica. The updated interior is packed with goodies and some of the key elements are seven-inch touchscreen infotainment system, seven-inch instrument cluster, 10-inch HUD, 9-speaker JBL Dolby audio with Clari-Fi tech, remote key with memory, wireless Qi charging, rear armrest with capacitive touchscreen, leather-wrapped tilt and telescopic steering wheel, ten-way power adjustable driver (with memory) and passenger seats with lumbar support, sliding and tilting moonroof, multiple driving modes, etc.